A young man, brought up in a religious family, studies a science, and as a result he comes to doubt -- and perhaps later to disbelieve in -- his father's God. Now, this is not an isolated example; it happens time and time again. Although I have no statistics on this, I believe that many scientists -- in fact, I actually believe that more than half of the scientists -- really disbelieve in their father's God; that is, they don't believe in a God in a conventional sense. 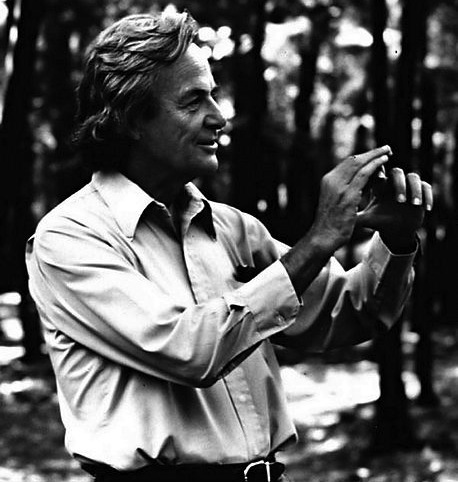 Feynman's words prompt a key question: Are all true scientists destined to become atheists? The answer, I believe, is no, or at least that doesn't seem to be the case judging by statistics. I do not believe that science can disprove the existence of God; I think that is impossible. And if it is impossible, is not a belief in science and in a God -- an ordinary God of religion -- a consistent possibility? Here, Feynman is in agreement with other notable scientific minds, including Carl Sagan and Albert Einstein. Where evidence is lacking, concrete proof cannot be attained. Thus -- at this time -- we cannot conclude that God exists, but we also cannot conclude that God does not. What happens, then, is that the young man begins to doubt everything because he cannot have it as absolute truth. So the question changes a little bit from "Is there a God?" to "How sure is it that there is a God?" This very subtle change is a great stroke and represents a parting of the ways between science and religion. If they are consistent with their science, I think that they say something like this to themselves: "I am almost certain there is a God. The doubt is very small." That is quite different from saying, "I know that there is a God." I do not believe that a scientist can ever obtain that view - that really religious understanding, that real knowledge that there is a God - that absolute certainty which religious people have. Admitting uncertainty not only bridges the divide between science and religion, but also -- I believe -- can do the same when applied to a great many of life's seemingly perpetual disputes. value to realize that we do not know the answers to different questions.